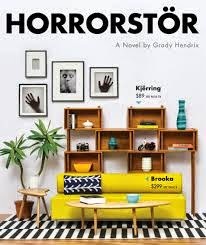 I read Horrorstor, by Grady Hendrix, a few months ago, and I've been on the edge of my seat waiting to report back to you all about it. Set in Orsk, an IKEA-like chain furniture store, all is not right with the world. "Every morning, employees arrive to find broken Kjerring wardrobes, shattered Brooka glassware, and vandalized Liripip sofa beds—clearly, someone or something is up to no good (Goodreads)." Five employees take on an after-hours expedition to uncover the truth behind the strange happenings in the store. One overbearing manager, one employee on the verge of being fired, one woman who seems naively devoted to the cause, and two ghost hunter wannabes. What they find after hours is nothing short of gory, B-movie fun: sudden graffiti on the bathroom walls, strange gooky smells, hidden doorways, ghostly perpetrators, slit throats, and unlikely torture devices. There are fairly equal positive and negative parts of this book. On the positive side, I really liked the possibilities for social commentary presented by a horror story set in an overwhelmingly large and pervasive chain store. Sweet deal! It's hell! I think I expected more shades of "IKEA catalog." The book has chapters with illustrated furniture and a blurb that gives a retail feel at the beginning of each chapter but that was all of the "catalog" I got. There may have been a few between-chapter pictures, but my e-galley was jacked and those pages were unreadable. I think I wanted more of the cover sprinkled throughout the book. I did find this novel fairly suspenseful. I read the majority of it in a day, so that's pretty high praise from me of the crappy attention span. But on the flip side, I found the characters quite cookie cutter and some of the dialog stilted. However, to be fair, I think these aspects of the writing give it more of that B-movie feel I mentioned earlier, so that's not entirely a bad thing. On the whole, this is a really fun, and in many ways innovative book, but don't go into it expecting a blow-your-socks-off narrative. 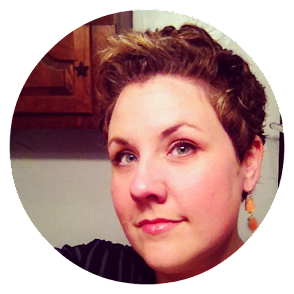 It's really about the whole package and what you can glean from its quirks. Source: Edelweiss in exchange for review consideration. Definitely, Sam! I think it'd be a great RIP choice, especially. It's a quick one. I think a store like that is the perfect setting for a horror story. I hate the way IKEA is laid out. YES! That layout plays a big role. I laughed out loud at "Sweet deal! It's hell!" :D I wanted more of the cover throughout the book, too. And I had a physical copy. But yes, B-movie!! LOL, me too! I thought the little illustrations at the beginnings of chapters were fun, but MORE. This sounds like a fun, quirky book, but not one to take too seriously. I'm intrigued! I actually can't wait to read this. Quirk books are always unique, so I'm pretty excited. I think this sounds like total fun!! I liked this goof ball book. It was fun to read... and honestly I can't wait to go to IKEA again after reading this. I don't think I will ever see the store the same again. I'm going to be reading this for RIP pretty soon! There's a review copy headed my way as we speak, and I'm really looking forward to it (despite reports of cardboardy characters). I am just in the mood for something spooky. Well poo, I wanted to hear that it was The Best Thing Ever. Although on the bright side, I no longer have a burning desire to run out and buy it. I really like that Quirk takes risks like this, but I have found that a lot of times the plot/characterization suffers for form. I felt that way about The Resurrectionist last year. What a fun idea for a story! I didn't get to this one before I left for September, so now I'm saving it for Readathon. Can't wait! This sounds very unique and seems like a fun story, but I'll definitely try to get my hands on a physical copy in hopes that would add to the experience.